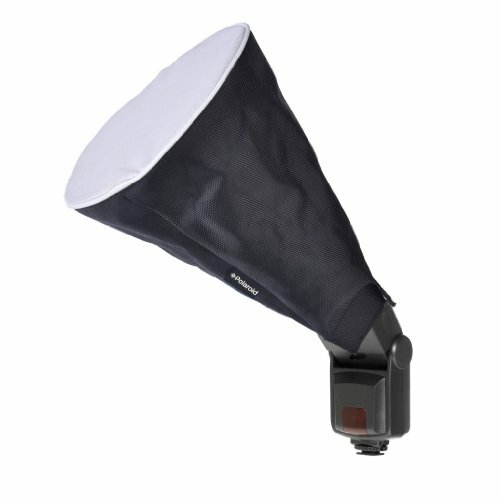 Polaroid Universal Collapsible Circular Cone (Trumpet) Studio Softbox For The Canon Digital EOS Rebel SL1 (100D), T5i (700D), T5 (1200D), T4i (650D), T3 (1100D), T3i (600D), T1i (500D), T2i (550D), XSI (450D), XS (1000D), XTI (400D), XT (350D), 1D C, 70D, by Polaroid at Kmpacting Studio. MPN: PLD-IFTP-1. Hurry! Limited time offer. Offer valid only while supplies last. Create beautifully softened light on the go. The Polaroid trumpet diffuser is lightweight and collapsible, a perfect combination for easy storage.